Chuathbaluk is located on the north bank of the Kuskokwim River, 11 miles upriver from Aniak in the Kilbuk-Kuskokwim mountains. It is 87 air miles northeast of Bethel and 310 miles west of Anchorage. It lies at approximately 61d 34m N Latitude, 159d 13m W Longitude. (Sec. 10, T017N, R055W, Seward Meridian.) Chuathbaluk is located in the Kuskokwim Recording District. The area encompasses 4.2 sq. miles of land and 2.1 sq. miles of water. A continental climate prevails in Chuathbaluk. Snowfall averages 85 inches per year, with a total precipitation of 17 inches per year. Temperatures range from -55 to 87. Heavy winds can cause flight delays in the fall. The Kuskokwim River is ice-free from mid-June through October. Chuathbaluk was the site of an Ingalik Indian summer fish camp in the mid-1800s. 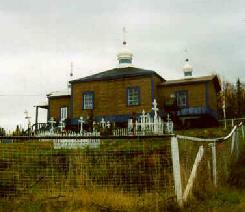 The village has been known as Chukbak, St. Sergius Mission, Kuskokwim Russian Mission, and Little Russian Mission. The village was often confused with Russian Mission on the Yukon, so in the 1960s the name was changed to Chuathbaluk, which is derived from the Yup'ik word "Curapalek," meaning "the hills where the big blueberries grow." The Russian Orthodox church built the St. Sergius Mission by 1894, and residents of Kukuktuk from 20 miles downriver moved to the mission. Tragically, much of the village was lost in an influenza epidemic in 1900. By 1929, the site was deserted, although Russian Orthodox members continued to hold services at the mission. In 1954, the Sam Phillips family from Crow Village resettled the mission, and were joined later by individuals from Aniak and Crooked Creek. The Church was rebuilt in the late 1950s, and a state school opened in the 1960s. The City was incorporated in 1975. Chuathbaluk is primarily an Eskimo village, with some Athabascans. Subsistence is a crucial source of food, since employment opportunities are seasonal. Chuathbaluk's economy is heavily dependent on subsistence activities. Employment is primarily through seasonal summer work firefighting for BLM, working at the local sawmill, Nelson & Sons, or commercial fishing. Two residents hold commercial fishing permits. The school, City and clinic provide some year-round employment. Local artisans produce fur garments, beadwork, Mukluks, kuspuks and ulus. Salmon, moose, black bear, porcupine and waterfowl are harvested. Water is pumped from a 105-foot well into a storage tank, then treated and hauled from this point by residents. A washeteria is available. The school has its own watering point, and some homes have individual wells. 80% of homes do not have complete plumbing. Honeybuckets and privies are used by most residents for waste disposal; a few homes have septic tanks. The school and clinic have a septic tank/leachfield system, as do several homes. The septic systems are failing due to clay and silt. A water and sewer Master Plan has been funded to examine needed repairs to the pump house, water treatment, washeteria, school sewage lagoon and other components. Refuse is collected weekly. The Middle Kuskokwim Electric Co-op provides power from Chuathbaluk to Stony River. The Kuskokwim River serves as the major carrier for supply barges from Aniak and Bethel, skiffs and float planes. A 1,560' State-owned gravel airstrip is located one mile north of the village, with scheduled air service. In the winter, skiplanes land on the frozen river and vehicles are sometimes driven on the ice road to neighboring communities. A continental climate prevails in Chuathbaluk. Snowfall averages 85 inches per year, with a total precipitation of 17 inches per year. Temperatures range from -55 to 87. Heavy winds can cause flight delays in the fall. The Kuskokwim River is ice-free from mid-June through October.